If you're new to Vegas Slots, you'll first have to register before you can play. This is a quick process; simply fill your account details into the form that comes up, agree to the the terms and conditions, then click on the "Register For Vegas Slots" button. Your account will be created right away and you will be redirected to the game lobby - you're ready to play! Be sure to use a valid e-mail address and make note of your password - your email and password combination are used to log in on future visits. Prize winners will be contact via e-mail. If we can't reach you, you can't win! Once you've ended your browser session, you will automatically be logged out of Vegas Slots. The next time you visit, you will be required to log in again before you can play. To log in, simply enter the e-mail address and password you registered with at the top of the page, then click "Login". You can then visit the game lobby and play once again. The casino lobby is where you'll choose the games you'd like to play. Each game has a corresponding icon. Simply click on the icon of the game you wish to play, and it will load 'overtop' the lobby. To return to the lobby and close the game, click on the "GAME LOBBY" button from within the game itself (on the bottom left.) This will end the current game session and make the lobby page accessible again. Please note: Closing slot games during bonus rounds may result in that bonus being forfeited, so be sure to wrap up any bonuses or free spin rounds before closing the game and returning to the lobby. If you've played online video slots at a casino before, you should already be relatively familiar with the layout of each slot game. Each slot game can be played with a coin size between $0.01 and $5.00. The default coin size is $0.05, but you can adjust that amount using the +/- buttons underneath the COIN SIZE display. 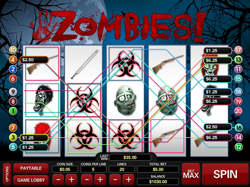 Each slot game can be played with 1 to 5 coins per line. By default the maximum of 5 coins per line is selected, but you can adjust that amount using the +/- buttons underneath the COINS PER LINE display. Each slot game has 20 pay lines. By default, all lines are played - but you can adjust the number played using the +/- buttons underneath the LINES display on the bottom of the game. When adjusting the number of lines played, you will see the actual lines on screen over the reels. 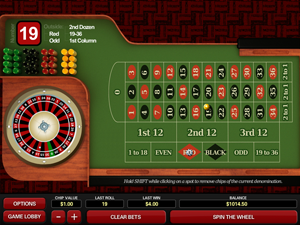 Each slots pay table can be viewed by clicking on the PAYTABLE button on the bottom left of the game. Sound options can be controlled using the OPTIONS button beside it. Once you've set the game options to your preferences, simply click on the SPIN or the BET MAX button to play. Free spins and bonus games are available depending on the slot you choose, and will launch as specified in the pay table when the right symbol combinations appear. Please note: Vegas Slots will not remember your game preferences between sessions, they will need to be changed every time a new slot game is loaded. For example, if you change the coin amount to $5, return to the lobby then re-launch the game, it will revert back to the default $0.05 amount. Technically "mini" baccarat, there's really not much to it! Start by choosing the amount you'd like to wager. The bet amount is $5 per hand by default, but can be changed between $5 and $250 using the +/- buttons underneath the BET AMOUNT display. Choose whether to wager on a TIE, the PLAYER or the BANKER by clicking on the corresponding button on the bottom of the game. The hand will automatically be dealt out, and winning bets paid. You can only bet on one of the three options each hand. Sound options can be changed by clicking on the OPTIONS button and setting your preferences. Click on the GAME LOBBY button at any time to return to the main menu. Insurance pays 3 to 2. Player can double on initial hand values of 9, 10 or 11. Dealer stands on all 17's and hits with 16 or less. Player will receive only one additional card on each hand when splitting aces. To play, first set your desired bet amount. The bet amount is $5 per hand by default, but can be changed between $5 and $25 using the +/- buttons underneath the BET AMOUNT display. 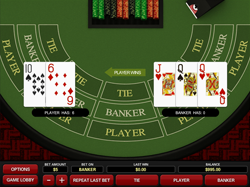 Click on the DEAL button to start a new hand at the specified bet amount. The player and dealers initial hands will be dealt out. The buttons at the bottom of the page will change after the initial deal. Buttons that are red are available options for the player. Buttons that are gray are options that are not currently available. After splitting hands, the currently active hand will be shown as normal, while the additional hands will darken slightly. Once the active hand is completed (if you stand, bust or get 21) the game will cycle to the next available hand awaiting your options. After a hand is completed, you will be prompted to "click anywhere to continue." Doing so will clear the table, after which a new deal can be started. As with any Blackjack game, choosing options such as DOUBLE or SPLIT will require an additional bet be placed equal to the original bet amount. If you're not familiar with the various betting options, craps can be a somewhat difficult game to play. Which spots you're allowed to bet on depends on certain conditions; some bets will be shifted to other spots after certain rolls, and some bets are per-roll while others remain on the table. 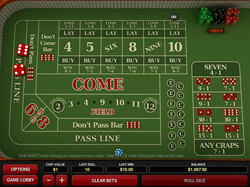 For in-depth information and general craps instructions please visit http://www.online-casinos.com/craps. While you might want to read up on the general rules if you've never played, you can get some help in-game. Hold the space bar on your keyboard then click on a spot for more information on that betting option and its payouts. When trying to make a bet that's not permitted, the game will also tell you why it's not allowed. To start playing, first select the chip value you'd like to place. The default chip value is $1, but you can adjust that amount using the +/- buttons underneath the CHIP VALUE display. You can bet between $1 and $250 per spot. Click on "ROLL DICE" after bets are placed on the table to put those bets into play. Some bets can be removed after being put in play, some cant. (Craps is tricky that way.) Clicking on the CLEAR BETS button will remove all bets that are permitted. Please note: Bets in play will NOT be remembered if you return to the lobby or close the casino. Please make sure all bets are finished and/or cleared beforehand to avoid forfeiting existing bets if leaving. A European style (single zero) roulette table. Please note: While the cost of all bets out on the table are deducted from your balance after every spin and any wins resulting from those bets are credited after each spin is complete, bets are not automatically removed from the table between spins. Once a spin is completed, individual bets can be added, adjusted or removed, or all bets can be cleared by clicking on the CLEAR BETS button on the bottom of the game. Any bets showing on the table will be deducted from your balance each time you spin. You can bet between $1 and $250 on each outside spot (Black/Red, Even/Odd, 2nd 12, etc.) You can bet up to $100 on individual numbers, $200 or split numbers and $250 on corners. Click on the SPIN THE WHEEL button after bets are placed on the table to put those bets into play. Again, you will need to remove any (or all) bets you do not want remaining before initiating a new spin, or they will be played again. Bets out are only deducted from your balance after a new spin is started, so closing the the game while chips are on the table will not 'forfeit' any wagers provided the wheel isn't already spinning. 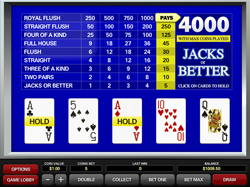 A classic, single hand "machine" - our Jacks or Better game plays just like any online version you're accustomed to, or a classic VPT. To get started, first choose the coin value and number of coins to bet. By default, the coin value will be set to $1.00, and only one coin is bet. You can change the coin value between $0.25, $1 and $5 using the +/- buttons underneath the COIN VALUE display. You can adjust the number of coins bet by clicking on the BET ONE button until the desired number (between 1 and 5) is reached. The pay table will highlight the corresponding payouts, and a hand will not be dealt until you click on the DEAL button. Once you've decided on your betting options, click on DEAL to start the game. Your initial 5 card hand will be dealt out. Click on any cards you want to keep (HOLD), then click on the DRAW button (where the deal button previously was) to replace any cards that were not held. After the draw, the hand is over and your win (if applicable) will be displayed under LAST WIN at the bottom of the game. However, it is not immediately credited to your balance, as you have the option to try and double it if desired. If you don't wish to double after a win, clicking on the COLLECT button or simply starting a new hand will collect the win. If you do wish to double, click on the DOUBLE button instead. 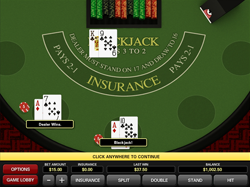 After any winning hand, a player may choose to try and double their win. To do so, start by clicking on the DOUBLE button. 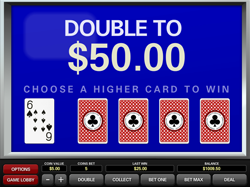 The screen will change to the double or nothing option, at which point one card on the left is flipped, with 4 more cards (backs showing) to the right. To play the double, simply choose one of the 4 cards to the right to flip it. If it's higher than the card shown to the left, you win and double your previous win. If it's lower, the round is over and you win nothing. After a successful double you can either collect the win by clicking on the COLLECT button, or try to double it again by clicking on the DOUBLE button again, at which point 5 new cards will be dealt out. You can continue this process as many times as you'd like, until you either lose or collect.